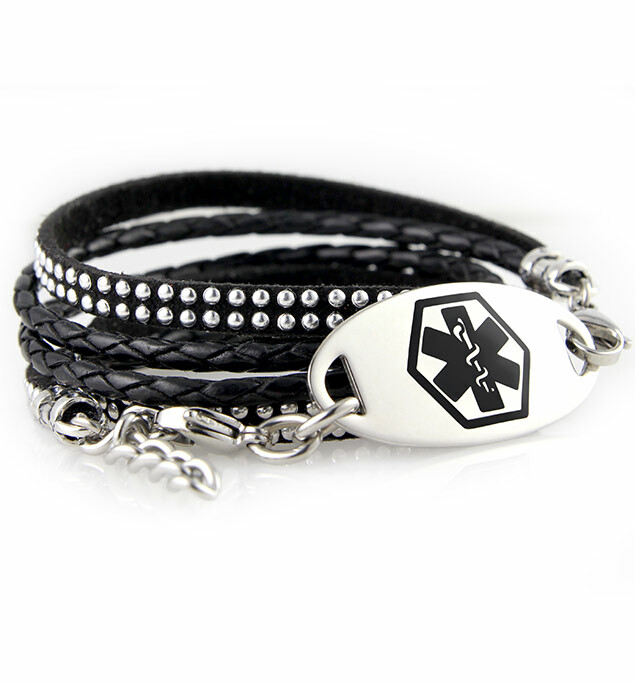 Alex is a dual-strand, wrap-style, leather medical ID bracelet in black with silver accents. The Alex Medical ID Bracelet comes with a custom engraveable medical ID tag. All of our wrap bracelets feature a custom-engravable medical ID tag so you can wear it just the way you like! A customer favorite, the Alex Medical ID Bracelet is a great choice whether you wear your medical alert jewelry for asthma, steroid dependency, kidney failure, or any other medical concern. Wrap medical ID bracelets are particularly convenient for those looking for stylish medical alert options after a mastectomy or weight loss surgery, as the wrist swelling associated with lymphedema and the weight changes from bariatric surgeries make the adjustability of a wrap ideal. No matter what your conditions or concerns, the Alex Medical ID Bracelet is a comfortable medical alert that really goes with everything. Leather medical ID jewelry is safe for handwashing. However, we recommend keeping your leather medical alert bracelet dry to help extend its life. Leather and cotton medical alerts are not recommended for pool or ocean wear.